Bio-Simplex™ spinner flask accessories enable end users to maximize their investment in laboratory glassware while still enjoying the time and cost benefits of single-use technology. The molded one-piece construction of these filling assemblies creates a seamless fluid path that eliminates contamination as well as product loss due to loose connections. 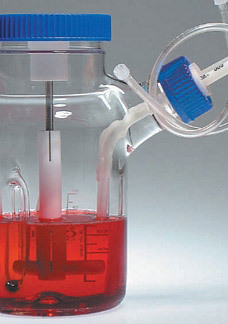 The assembly consists of an EZ Top® stopper and tubing, made from animal derived component free (ADCF) C-Flex® pharmaceutical grade thermoplastic elastomer (TPE) resin; a Bio-Simplex™ FlexJoint™, which accommodates angle deviation in hand-blown spinner flasks and eliminates tube kinking and shape loss after autoclaving; and a polypropylene cap. The entire system is engineered to ensure an unobstructed fluid path, extremely low levels of extractables, and a secure elastomeric seal against glass, plastic and metal surfaces. Customer-generated designs, sizes, packaging and other options — such as connectors, heat-sealed ends or alternate flask materials — are available on request.